Nice work man, very very nice work. ATR84 wrote: You will need to remove some of the boot interior to get access. And the inside rear quarter panels (to get into the front of the arches/rear of the sills). Brings in to focus the idea that bodywork is now something to be mindful of, to not take for granted. Worries me to see more ludes succumb to rot. Or to see Ludes broken for spares, more profit in breaking than maintaining. Headed to Leeds, specifically Garforth for anyone who knows the area. Not a good time to be driving with all the salt on the road, (was meant to go couple of weekends ago, but the weather kinda messed that up). Filthy and with lights that need a good polish! Next day onto York and a long chat with Honda as to where next. Last year at JAE I got some good advice as to areas I should look into, my thinking that, in OEM form, I might just be able to get it into a 'Show & Shine', (and obviously take a bunch of photos so that I might myself silly). In my opinion OEM has a place. 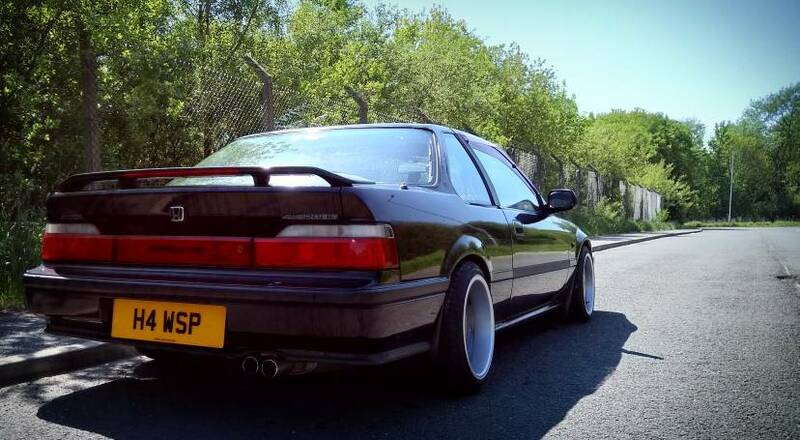 It provides the benchmark to demonstrate just what the Prelude can be in the hands of a skilled tuner, and also, that in original form it is still quite the car. I swear I have had BMW drivers scratching their heads and wondering WTF is he driving, and why haven't I gone away! I don't drive on a regular basis so taking the Prelude out is kind of an occasion, you know, select some tunes and give the engine a spot of exercise, get some heat in the block. I've given myself a reasonable budget and sort of created a wish list, might take till the cars 20th birthday to complete it all. First off the belts needed checking and the whine on idle sorted. 3 nasty pin dents, couldn't figure out how on earth I got those, until Ratty pointed out the obvious, kinda bouncing bomb stone ricocheting on the side. Hopefully the bolts haven't fused so that the manifold cover can be removed and shot blast or something. Needs a tidy. Thinning paint on the inner aspect of the wings. Tidy up the front cross member, replace radiator brackets, rusty bolts, rub down and re paint. Tidy up cruise control servo. Get the lights polished up. Adjust cruise control switch on break pedal. Oh, also replace back light on the ventilation switches. I sought reassurance from the bodyshop regarding the new rear arches, apparently they'll last longer than the rest of the car and have been fully rust proofed, happy with that. The only issue that gradually cropped up was what Ratty explained was called 'sink'. Over a period of time I began to notice a subtle line along the one then both rear arches. To my eyes it wasn't easy to spot, but definitely there and slightly more apparent as time went on. The arches are thankfully under warranty, so will get that sorted. The front end will need a respray at some point as I have accumulated a few stone chips to the bumper and leading edge of the bonnet. Plus some bits on the wings. That may have to wait till next year, not sure. 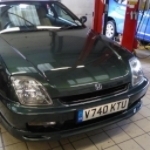 For now the Lude is with Honda and their bodyshop and given the backlog and that I prefer they take their time, rather than rush, it'll be June when I collect. Hopefully the results will impress. Last edited by norks27 on Tue Mar 20, 2018 12:19 pm, edited 1 time in total. I'll admit to temptation to veer from stock, mainly ride height, although riding on the OEM lowered springs, arguably, Honda didn't quite go low enough? (though the dip into the car park would see the front lip wrecked if I lowered). I discussed with my Dad the idea of swapping out the yellow indicators on the wing for the clear version. After much chin scratching it was decided the original had to stay. Did you have Motegi lowering springs? They were OEM so you can say that everything is still stock in the car.